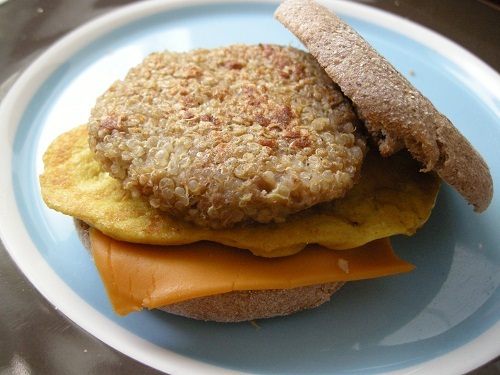 Scott used to love breakfast sandwiches in his pre-vegan days so he's been pestering me to make the "egg" macguffin recipe in Vegan Comfort Food. The recipes calls for pre-made sausage patties and I knew I wanted to use Gimme Lean but was dreading trying to mold it into patties. If you're unfamilar with Gimme Lean let me be the first to sing its praises to you. Not only is it a vegan meat substitute, it's fat-free and delicious (this coming from someone who usually dislikes fake meat). My only complaint is how difficult it can be to work with-- its a bit unstable and finky when you try to mold it into patties. It's also really sticky. As I was trying to work with it (and cursing up to the stars about how I hated working with it) I remembered that people starting to add bread crumbs to hamburger meat, not for taste, but to make the meat go farther, and coincidentally, that made them better... So I posed the question: why couldn't quinoa do the same for my mock sausage meat? I did a little experiment and success! The addition of quinoa improves both the quality and the consistency, makes the patty a little more well rounded (nutritionally speaking) and it more than doubled the number of sausages I nomrally get get from one tube of Gimme Lean! Yahoo!